Motorcycle bays are available throughout Brighton & Hove and they are free for all solo motorcycles. 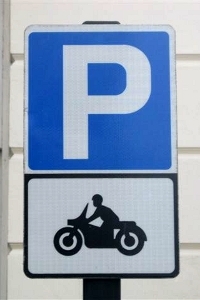 Motorcycles are not permitted to park in other bays such as; resident permit bay or pay & display (even if displaying a valid pay & display ticket). Can I park in a motorcycle bay? Only solo motorcycles can park in a motorcycle bay. Why do we have motorcycle bays? We have motorcycle bays so solo motorcycles can park in a bay dedicated for their use. This minimises damage to motorcycles and other vehicles. They are also free to use. Motorcycles are seen as a sustainable form of transport, so we're committed to encouraging their use as an alternative to the car. How do I know when restrictions apply? The sign on the street will have this information. If no times are shown the bay operates at all times, 24 hours a day and every day. Is there a list of motorcycle bays available? Please see the available motorcycle bays (PDF 39kb) document for a full list of all of the streets in Brighton & Hove where motorcycles can park. You can also find further information on where motorcycle bays are located on the Park-Up website. The council has been putting in motorcycle locking points around the city. These appear on the available motorcycle bays (PDF 39kb) list marked in bold with an (S) at the end of the street name. Where can I park my trike? A trike cannot be parked in a motorcycle bay but you can park them in a pay and display bay. Please ensure that the pay and display ticket is secure and that it cannot fall off. If you are a resident of Brighton & Hove then you are able to purchase a resident permit. You will need to ensure that you can securely display your permit. I have received a Penalty Charge Notice when parking in a motorcycle bay what do I do? pay the Penalty Charge Notice. appeal the Penalty Charge Notice.